This was a sort of strange dish I concocted. It did not get raving reviews from the family so I won't post the recipe. Everyone did eat it though, even while sort of complaining about it. I actually liked it and went back for seconds. Basically I sauted some shrimp, red bell pepper and garlic and set it aside. Then I mixed part of a can of coconut milk, lime juice, chicken stock, a bit of fish sauce and arrowroot and simmered until thick. Then I added chopped and steamed cauliflower and the shrimp back in. 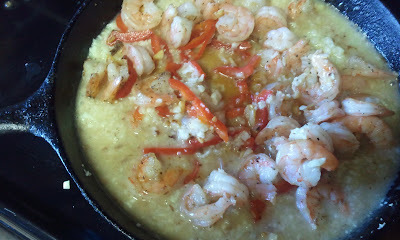 It looked like shrimp and grits, but had a coconut-lime flavor. Anyway, it's what we had for dinner, I guess they can't all be winners!